The purpose of hand and wrist radiograph analysis is to determine parameters such as patient's skeletal age, the amount of growth left and to determine whether to use functional appliance or to wait until growth ceased and performed extraction or surgery. 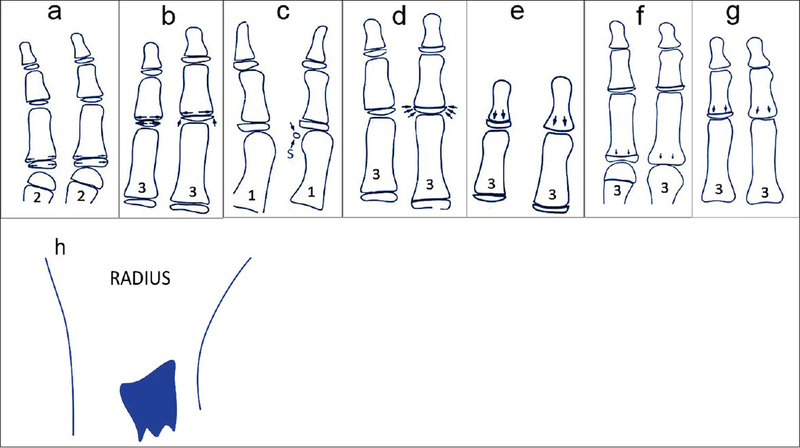 Bjork and Helm used four stages of bone maturation, all found at five anatomical sites located on the thumb, second finger, third finger, and radius. However, eight discrete adolescent skeletal maturity indicators covering the entire period of adolescent development are found on these five sites [Figure 1] and [Figure 2]. On the other hand, Fishman used eleven indicators covering the entire period of development. 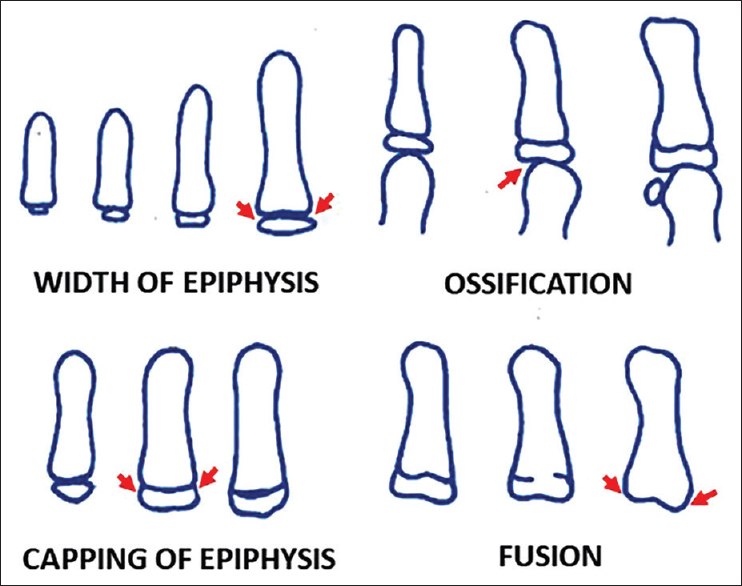 The sequence of ossification progresses through four stages; A-Width of the epiphysis equal to the width of the Diaphysis. B-Sesamoid ossification (small calcified bone at the Thumb) C-Capping Stage. D-Fusion stage. The objective of this review is to give an overview of the current methods of skeletal age assessment and to highlight the simple method of hand-wrist radiograph as an indicator using Bjork system. 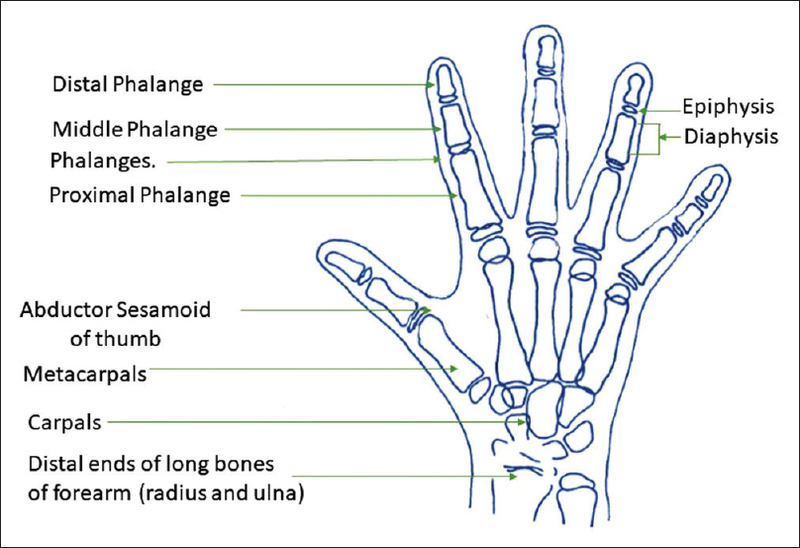 Each phalange consists of epiphysis and diaphysis. The development of the epiphysis and diaphysis of growing child not only differs in the timing of the maturational events (width, ossification, capping, and fusion [Figure 3] but also in the sequence of these events. On the other, the development stage has considerable influence on orthodontic diagnosis and treatment planning. 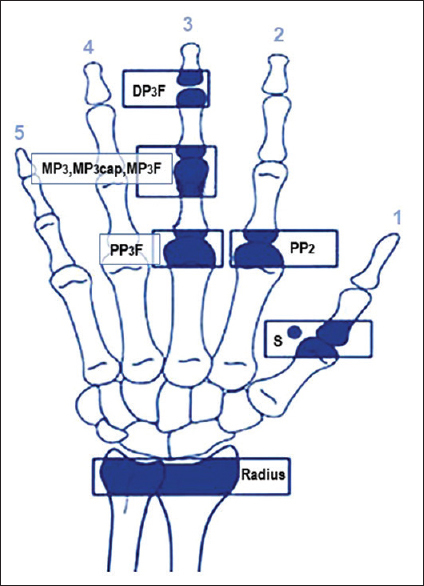 Middle phalanx of the third finger (MP3) [Figure 4]a and [Figure 4]b.
Radius (R), [Figure 4]e,[Figure 4]f,[Figure 4]g,[Figure 4]h.
Following the diagram in [Figure 5] and [Figure 6], the skeletal age can be determined. The following steps should be followed depending on the presence of the Sesamoid Bone (S) in the hand and wrist radiograph to determine the skeletal maturity stage in hand and wrist radiograph. If there is fusion in the radius bone, then the patient is in Radius stage (R) where most of the growth was utilized. Greulich WW, Pyle SI, Todd TW. Radiographic Atlas of Skeletal Development of the Hand and Wrist. Stanford: Stanford University Press; 1959. Rajagopal R, Kansal S. A comparison of modified MP3 stages and the cervical vertebrae as growth indicators. J Clin Orthod 2002;36:398-406. Boeyer ME, Sherwood RJ, Deroche CB, Duren DL. Early maturity as the new normal: A century-long study of bone age. Clin Orthop Relat Res 2018. DOI: 10.1097/CORR.0000000000000446. Macha M, Lamba B, Avula JS, Muthineni S, Margana PG, Chitoori P, et al. Estimation of correlation between chronological age, skeletal age and dental age in children – A cross-sectional study. J Clin Diagn Res 2017;11:ZC01-4. Baccetti T, Franchi L, De Toffol L, Ghiozzi B, Cozza P. The diagnostic performance of chronologic age in the assessment of skeletal maturity. Prog Orthod 2006;7:176-88. Olze A, Taniguchi M, Schmeling A, Zhu BL, Yamada Y, Maeda H, et al. Studies on the chronology of third molar mineralization in a Japanese population. Leg Med (Tokyo) 2004;6:73-9. Maber M, Liversidge HM, Hector MP. Accuracy of age estimation of radiographic methods using developing teeth. Forensic Sci Int 2006;159 Suppl 1:S68-73. Bala M, Pathak A, Jain RL. Assessment of skeletal age using MP3 and hand-wrist radiographs and its correlation with dental and chronological ages in children. J Indian Soc Pedod Prev Dent 2010;28:95-9. De Sanctis V, Di Maio S, Soliman AT, Raiola G, Elalaily R, Millimaggi G, et al. Hand X-ray in pediatric endocrinology: Skeletal age assessment and beyond. Indian J Endocrinol Metab 2014;18:S63-71. Crowder C, Austin D. Age ranges of epiphyseal fusion in the distal tibia and fibula of contemporary males and females. J Forensic Sci 2005;50:1001-7. Mohammed RB, Reddy MA, Jain M, Singh JR, Sanghvi P, Thetay AA. Digital radiographic evaluation of hand-wrist bone maturation and prediction of age in South Indian adolescents. Hand (N Y) 2014;9:375-83. Chapman SM. Ossification of the adductor sesamoid and the adolescent growth spurt. Angle Orthod 1972;42:236-44. Houston WJ, Miller JC, Tanner JM. Prediction of the timing of the adolescent growth spurt from ossification events in hand-wrist films. Br J Orthod 1979;6:145-52. Flores-Mir C, Burgess CA, Champney M, Jensen RJ, Pitcher MR, Major PW, et al. Correlation of skeletal maturation stages determined by cervical vertebrae and hand-wrist evaluations. Angle Orthod 2006;76:1-5. Ruf S, Pancherz H. Development of the frontal sinus in relation to somatic and skeletal maturity. A cephalometric roentgenographic study at puberty. Eur J Orthod 1996;18:491-7. Koshy S, Tandon S. Dental age assessment: The applicability of Demirjian's method in South Indian children. Forensic Sci Int 1998;94:73-85. Jiménez-Castellanos J, Carmona A, Catalina-Herrera CJ, Viñuales M. Skeletal maturation of wrist and hand ossification centers in normal Spanish boys and girls: A study using the Greulich-Pyle method. Acta Anat (Basel) 1996;155:206-11. Bakerly SD, Saleh F. Correlation of adductor metacarpophalangeal sesamoid ossification stages with dentofacial profile changes. Eur Sci J 2013;9:450-69. Grave KC. Timing of facial growth: A study of relations with stature and ossification in the hand around puberty. Aust Orthod J 1973;3:117-22. Fishman LS. Maturational patterns and prediction during adolescence. Angle Orthod 1987;57:178-93. Ghai O, Paul V, Bagga A. Essential pediatrics. 9th. Edition. New Delhi India: CBS Publisher and distributors 2018. p. 11. Bowden BD. Epiphysial changes in the hand/wrist area as indicators of adolescent stage. Aust Orthod J 1976;4:87-104. Moorrees CF, Fanning EA, Hunt EE Jr. Age variation of formation stages for ten permanent teeth. J Dent Res 1963;42:1490-502. Singer J. Physiologic timing of orthodontic treatment. Angle Orthod 1980;50:322-33. Kucukkeles N, Acar A, Biren S, Arun T. Comparisons between cervical vertebrae and hand-wrist maturation for the assessment of skeletal maturity. J Clin Pediatr Dent 1999;24:47-52. Flieger R, Matys J, Dominiak M. The best time for orthodontic treatment for Polish children based on skeletal age analysis in accordance to refund policy of the Polish National Health Fund (NFZ). Adv Clin Exp Med 2018;27:1-6. De Stefani A, Bruno G, Siviero L, Crivellin G, Mazzoleni S, Gracco A. 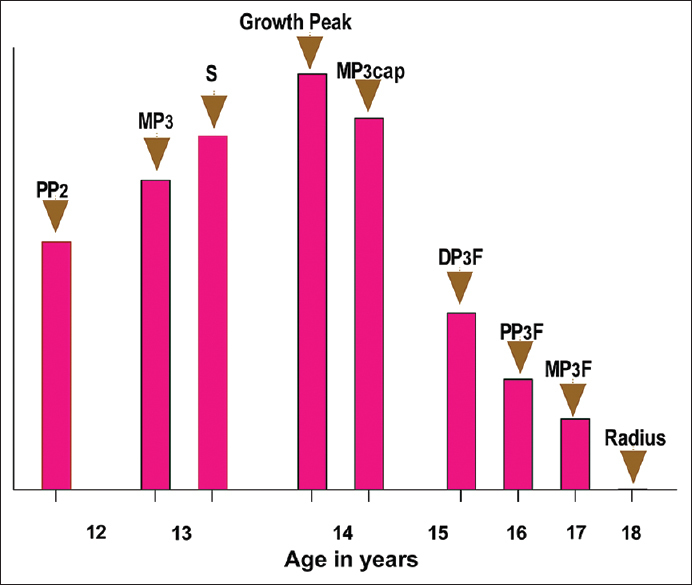 Middle phalanx maturation of the third finger (MPM) method in the evaluation of skeletal age in a growing orthodontic patient. Int Orthod 2018;16:499-513. Nolla CM. The Development of Permanent Teeth. In: University of Michigan; 1952. Demisch A, Wartmann P. Calcification of the mandibular third molar and its relation to skeletal and chronological age in children. Child Dev 1956;27:459-73. Demirjian A, Goldstein H. New systems for dental maturity based on seven and four teeth. Ann Hum Biol 1976;3:411-21. Baccetti T, Franchi L, McNamara JA Jr. The cervical vertebral maturation (CVM) method for the assessment of optimal treatment timing in dentofacial orthopedics. Semin Orthod 2005;11:119-29. Soegiharto BM, Moles DR, Cunningham SJ. Discriminatory ability of the skeletal maturation index and the cervical vertebrae maturation index in detecting peak pubertal growth in indonesian and white subjects with receiver operating characteristics analysis. Am J Orthod Dentofacial Orthop 2008;134:227-37. 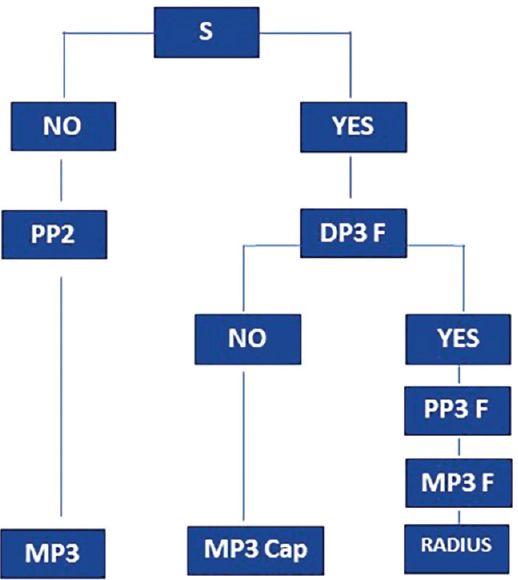 Caldas Mde P, Ambrosano GM, Haiter Neto F. Computer-assisted analysis of cervical vertebral bone age using cephalometric radiographs in Brazilian subjects. Braz Oral Res 2010;24:120-6. Szemraj A, Wojtaszek-Słomińska A, Racka-Pilszak B. Is the cervical vertebral maturation (CVM) method effective enough to replace the hand-wrist maturation (HWM) method in determining skeletal maturation? – A systematic review. Eur J Radiol 2018;102:125-8.